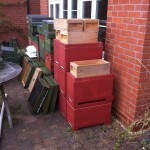 I’ve bought and used a number of Abelo poly hives this season. I’m going to review these once I see how the colonies perform overwinter. However, one of their ‘features’ is an integral landing board that forms part of the removable floor (colonies 1 and 3, facing, below). Landing boards are great. They provide a large flattish or gently sloping ramp that leads to the hive entrance. There’s something mesmerising about watching heavily-laden foragers performing an inelegant ‘tail-down’ crash-landing several inches short of the entrance, righting themselves, and marching purposefully forwards into the gloom of the hive. During a heavy nectar flow this happens dozens of times a minute, with a strong colony making about 35,000 foraging trips per day. It’s great to rest your elbows on the hive roof, peer over the top and watch hundreds of foragers bringing the nectar back, 40 milligrams at a time. 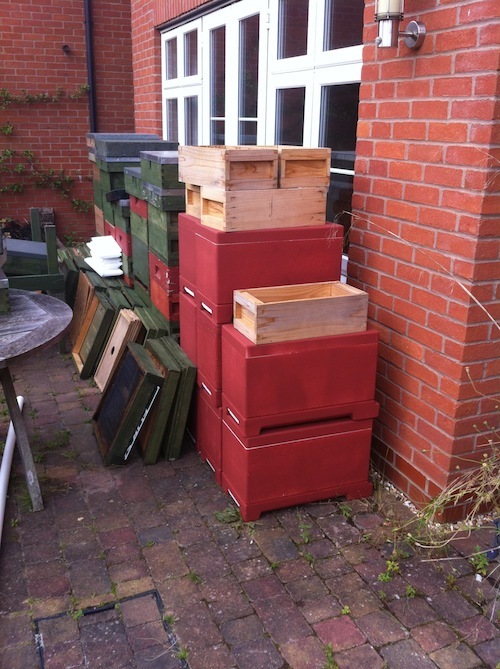 Landing boards must be popular with other beekeepers as well as they regularly feature in commercially available hives. The Abelo implementation is relatively neat, projecting perhaps 5cm from the front face of the hive. If your hives are cedar you can easily add a flat or sloping landing board to the front of the floor. If you’re going to do this use reasonable quality wood – the exposed edge of a strip of plywood tends to delaminate pretty quickly. Alternatively, build something cheap, functional and easily replaceable from Correx. 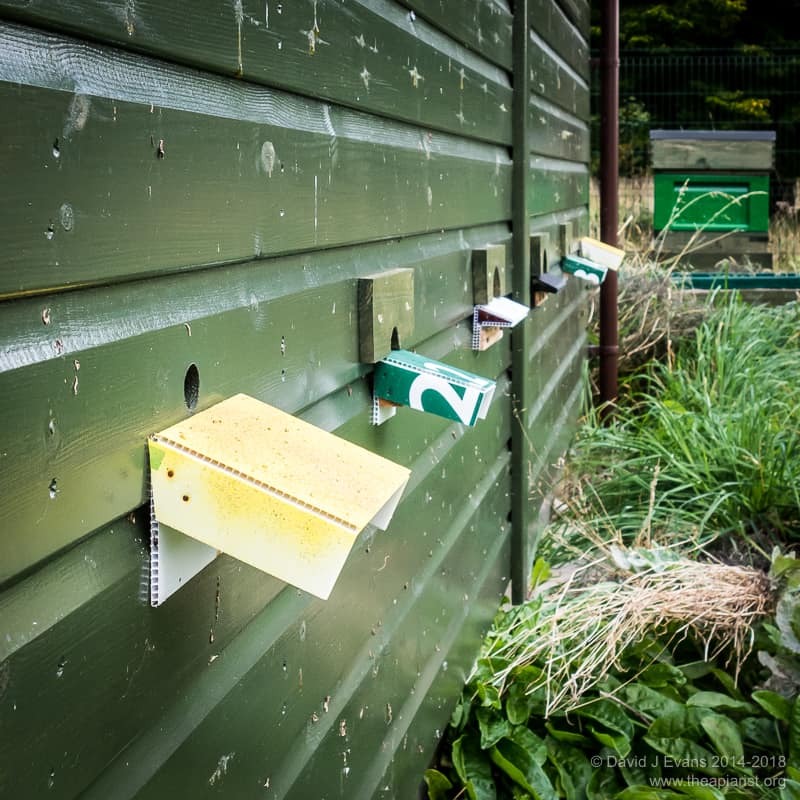 The bee shed houses up to 6 colonies, each with a simple short ‘tunnel’ ending in a 1-2″ aperture in the vertical shed wall. I’ve built simple Correx landing boards on these and they’ve performed extremely well over the last two years. 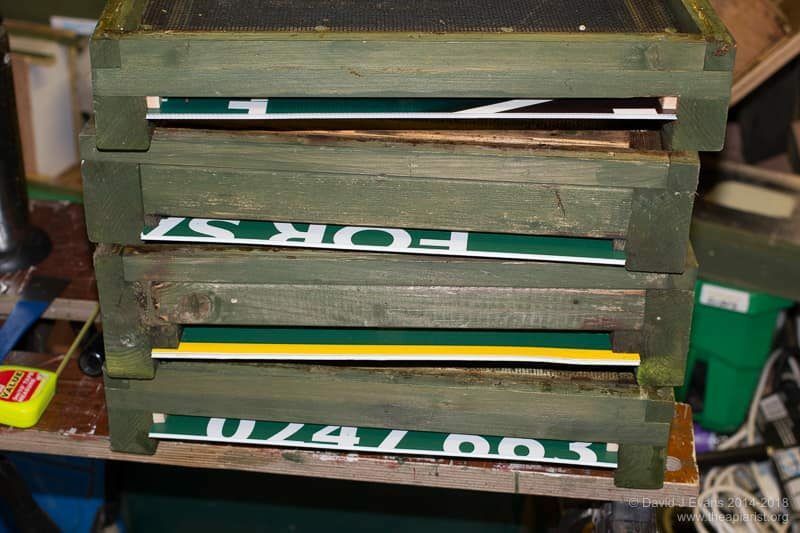 Each piece of folded Correx is a distinctive colour to aid the bees returning to the correct hive. If you take advantage of abandoned ‘For Sale’ signs you can get Correx in a wide range of contrasting colours which saves having to spray paint them before use. 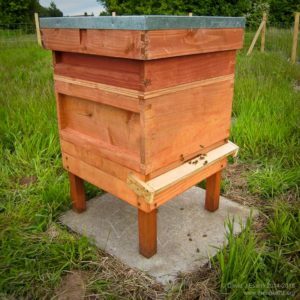 Landing boards don’t need to be attached to the hive front or floor. Some of our early research colonies were housed in lovely cedar hives built by Pete Little of Exmoor Bees & Hives. He provided stands with integral sloping landing (‘alighting’) boards. These are great, though they extend the need for compatibility from the hive itself to the stand as well. Despite the pleasure to be gained from watching bees return to the hive entrance, landing boards aren’t really necessary and they can get in the way. Feral colonies generally don’t have the benefit (or need) of a nicely sloping landing board. They cope admirably with a simple unadorned hole through the soffit, with nothing more than the painted boards to cling to … upside down. Crevices or holes in trees, or the church tower, probably have ‘grippy’ surfaces that aid arrival, but there’s no evidence they’re selected on any criteria other than the volume and overall location of the potential new ‘home’. I used to build my preferred floor – the kewl floor with a mouse-proof and wasp-resistant ‘L’ shaped underfloor entrance – with a shallow integral Correx or plywood landing boards. However, over time these all got damaged in transit, or I got sick of bees wandering underneath the floor if they landed on the stand, not the landing board. I’ve recently described a modified entrance to these kewl floors, again made from Correx, that is a marked improvement. There’s a very short video on the page describing these modified entrances showing bees landing and entering the hive perfectly well. The main problem with any sort of protruding landing board is that, by definition, it protrudes. It therefore gets in the way. 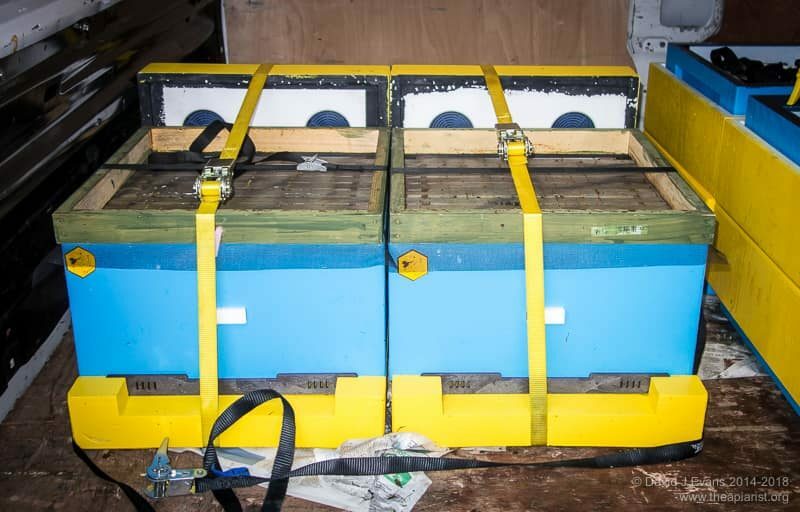 It makes strapping hives up during transport more difficult and means the hives don’t stack together quite as neatly. I only move small number of colonies about, so it’s the inconvenience, not the space, that is the issue. Similarly, during the winter or after uniting colonies in the season, spare floors and other pieces of kit need to be neatly stacked out of the way. Protruding landing boards prevents them being placed on the top of the stack (because the roof fouls the landing board) and – in certain orientations – stops stacks being pushed close together. As an aside, you probably don’t want these floors at the bottom of the stack. 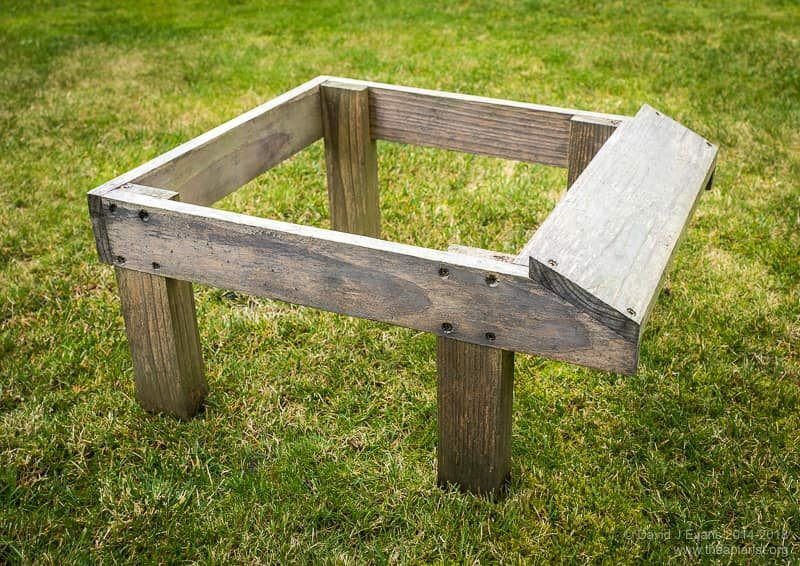 Firstly, you’ll inevitably need one when putting together a new hive and it’s easiest not to have to remove the entire stack to access the floor. 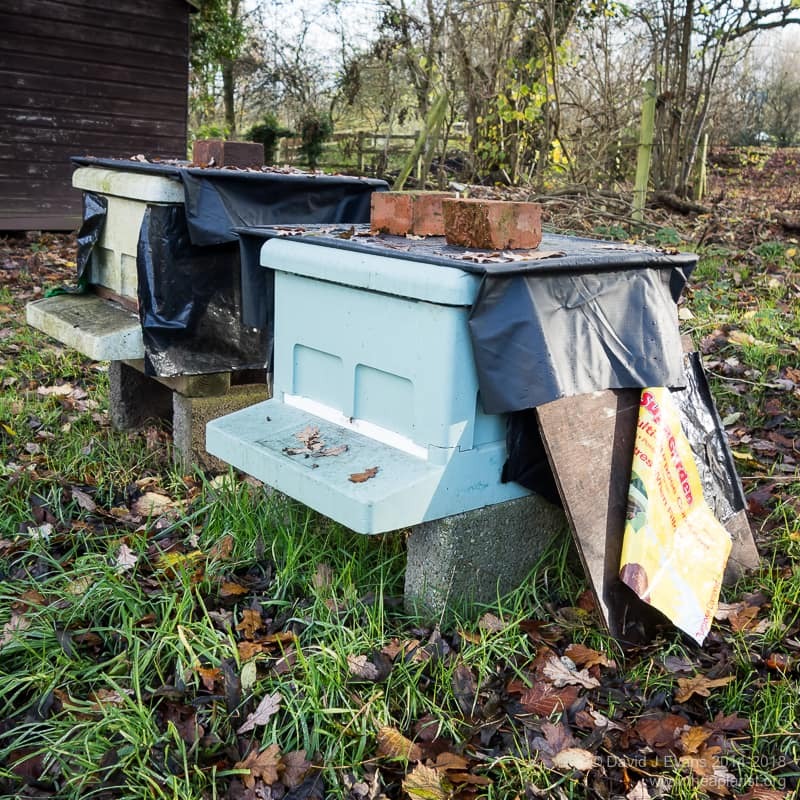 Secondly, unless blocked off with a sheet of polythene or Correx, they’ll allow wasps and bees access to the stack … or even encourage a swarm to move in. So … over the years landing boards on my hives have evolved or, more accurately, atrophied. They’re now only present on the outside of the bee shed, on purchased poly hives and, in a rather truncated version, at the cavernous mouth of the Thorne’s Everynucs that I favour. This entry was posted in Beekeeping, DIY, Floors and tagged floor, foragers, hive, kewl floor, landing board on September 29, 2017 by David. I have built all my hive stands myself to incorporate a slightly sloping landing board about 15 cm (6 inches) deep. They allow the bees to land gently in front of the entrance and walk in, as you describe, and when I close down the entrance to deter robbing and wasp attacks, the bees can easily walk up to the open entrance – they soon get used to where the opening is. They also allow me to attach with drawing pins a plastic tunnel over the entrance, another wasp deterrent method I have to use in my apiaries. I appreciate they don’t normally have this luxury in nature, but we are beekeepers trying to look after our livestock as best we can, that means giving them every assistance for an easier and healthier life. Nothing wrong with providing them with a little luxury … all I’m saying is that landing boards are probably not necessary. A strong colony with a small enough entrance to be defended shouldn’t be troubled by wasps. My kewl floors (mine as in the ones I build … not my idea) are full-width, but easy to defend without further reduction if the colony is strong. Nucs and weak colonies often need protection and the tunnel-type protection you describe is a good way to provide this. It would be interesting to see whether more bees return successfully – perhaps measured in pollen gathered or nectar collected – to a hive with a landing board and one without. It certainly looks like more are entering without crashing down early or bouncing off when there’s a landing board, but I suspect there wouldn’t be a significant difference. If, heaven forbid, the Asian Hornet arrives in your area, you may find the entrance tunnel on your bee shed helps to limit the efficiency of their predation on arriving and departing bees. I think any Asian Hornets arriving here won’t be troubling my hives because they’ll struggle to forage properly with the scarves, woolly hats and long-johns they’d have to be wearing to cope with the temperature. We have no European hornets here. 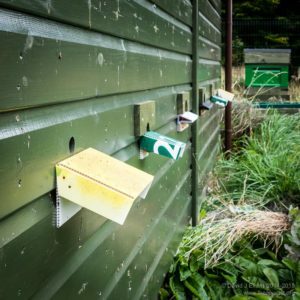 Modelling studies predicting the likely Northerly spread of the Asian Hornet have it petering out somewhere in the Scottish Borders. I discuss this in a recent – and now out-of-date (due to the isolates from Devon in the last couple of days) – post on predicting Asian hornet movement after it becomes established. PS I should add … I think the tunnel-type entrance is beneficial in helping the colony defend itself. The first entrances I built were too wide and they really need to be reduced to a simple 1″ hole. The hives in your pic are Paynes, not Maisimore. Good article – thanks. Thanks Matthew … I’ll add a footnote. Interesting, as usual, thank you. 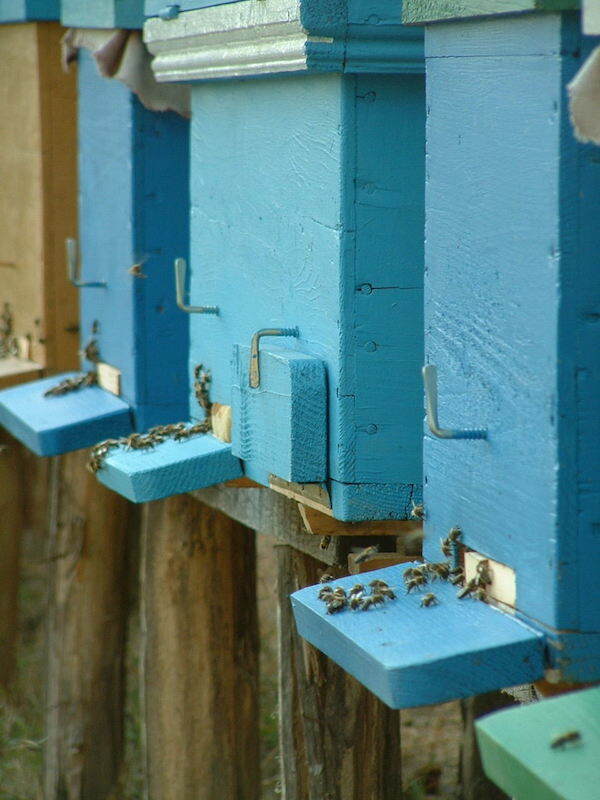 One of the more interesting landing boards that I have seen were on hives in Romania where a strip of wood was attached to the hive with piano hinge and obviously acted as a quick method of closing the entrance when hinged up – presumably this would also solve the problem of them getting in the way during storage. On the Asian hornet front and having spent a good few hours watching these at work, I suspect that the narrower the entrance the easier the hornets will find it to target the arriving bees. Since the advent of Asians here I have stopped using narrowed entrances in the autumn; whilst having no scientific evidence to the fact I felt that they were making the hornet’s life easier. There are interesting and clever designs on some continental hives, though I’ve not seen one like you’ve described. Good to hear that there might be ways to confound the hornet. Do the hornets simply stop targeting hives with wider entrance, or do they still hawk in front of them but find it harder to capture the bees? My understanding is that hornets hunting at the hive entrance keep the bees trapped ‘indoors’, even if there’s good forage to be had. The hornets keep targeting the hives, but would appear to be somewhat less successful in catching bees as they are coming in to a larger entrance – I suppose what I should say is that with a narrow entrance the hornets appeared to catch bees more rapidly than where there were full width entrances. Very neat landing board design. Thanks Guy. I suspect the commercials would still consider it too bulky. I know one who dispenses with the usual roof design we use in the UK, instead using a simply sheet of folded aluminium so the hives can be stacked together better for transport. Good luck with the hornets. No further news of isolates from the South West, but – as I’ve said here before – absence of evidence is not evidence of absence. Interesting and timely too. I’ve just been watching quite a few clearly overloaded bees fail to make the landing and falling on the ground in a small pile before climbing up some grass and having another go. I was planning to modify my kewl floors so that the correx piece comes out at 45degrees before folding back under and up forming a small wedge. However considering your comment about getting the roof on a stack of floors I think I’ll fix a piece of estate agent board to the stand instead. Much simpler anyway. Folded Correx works well as a landing board. I’ve done them like this on the bee shed. 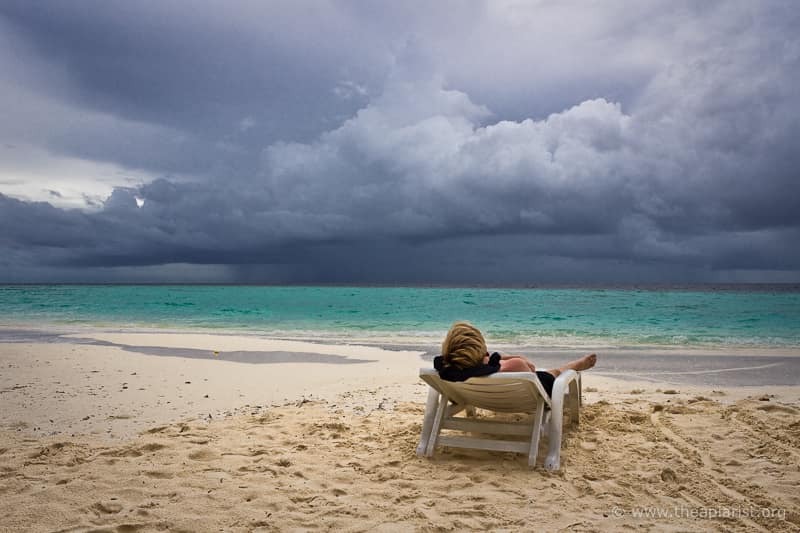 Correx is slippery stuff … try spray painting it with some paint and then sprinkling it with sand. I’ve done this on my (now vertical) entrances on my keel floors and it appears to work reasonably well. I suspect beekeepers are overly-influenced by the sight of bees crash-landing short of the hive entrance. If this was really a problem – meaning many of these bees didn’t eventually get back to the hive – it would probably have been noticed in terms of honey gathered or colony strength by now.